Museum staff regularly receive questions about the flags on display around the World War One Sanctuary. It is generally stated that the flags represent those who signed the Treaty of Versailles on the 28th of June 1919. But this is not correct. Given these curious decisions and some notable omissions, we needed to do more digging to solve the mystery of the flags. We have found that staff and volunteers have created a few stories to explain why some flags are included or are missing. The most consistently perpetuated myth is that Great Britain signed on behalf of the Dominions and that is why Australia, Canada and South Africa are not represented in the flags as the Union Jack covered all of the Commonwealth. In fact, these Dominions all signed the Treaty as co-signatories under the British Empire, but a decision was made to have the Union Jack to represent them in the display, with the New Zealand Ensign (flag) being a later addition. Another anomaly is that the Chinese flag is included despite not being a signatory - their diplomats did not attend in protest against the settlement in the Shantung province. 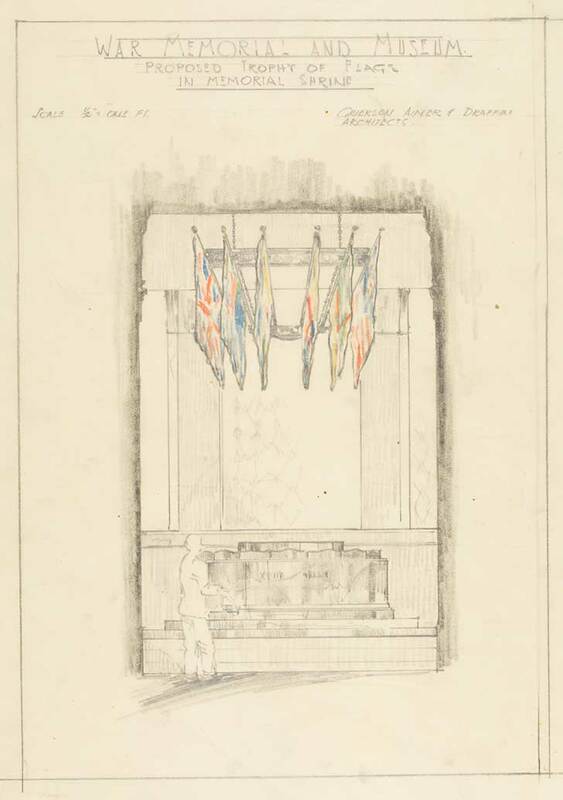 After some further research in the Museum Archives we discovered that the flags in general replicated those originally displayed in the Sanctuary in 1929. Information about this configuration was initially based on a list created when the flags were removed from display circa 1965. The list was subsequently reviewed against a sketch found with architects' plans, which included the New Zealand blue ensign (not on the 1965 list), and against a set of flags found in storage in the 1990s - to clarify which ones had been removed during WWII. These flags did not include any of those from around the Dominion, but it was thought appropriate to replace one of the four British flags with the New Zealand Ensign. Image caption: Grierson Aimer and Draffin, architects. 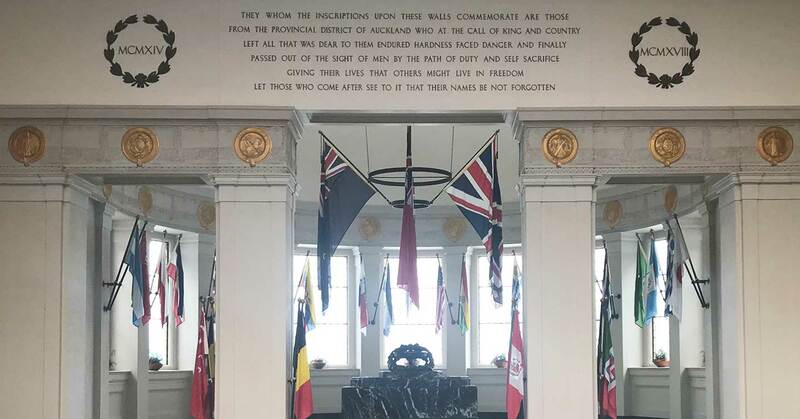 War Memorial and Museum Proposed Trophy of Flags in Shrine. Auckland War Memorial Museum - Tāmaki Paenga Hira MUS-2009-20-11-5. No known copyright restrictions. Therefore, the most likely theory is that that these flags represent the "Principal Allied and Associated Powers" as stated in the Treaty of Versailles. 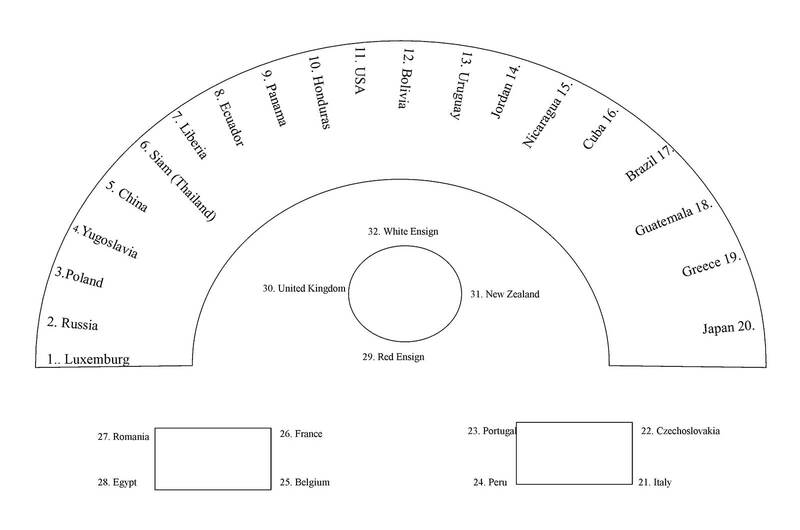 This list consists of the following nations or Dominions: The United States of America, the British Empire, France, Italy, Japan, Belgium, Bolivia, Brazil, China, Cuba, Ecuador, Greece, Guatemala, Haiti, the Hedjaz, Honduras, Liberia, Nicaragua, Panama, Peru, Poland, Portugal, Romania, The Serb-Croat-Slovene state, Siam, Czech-Slovakia and Uruguay. Passau, Victoria. 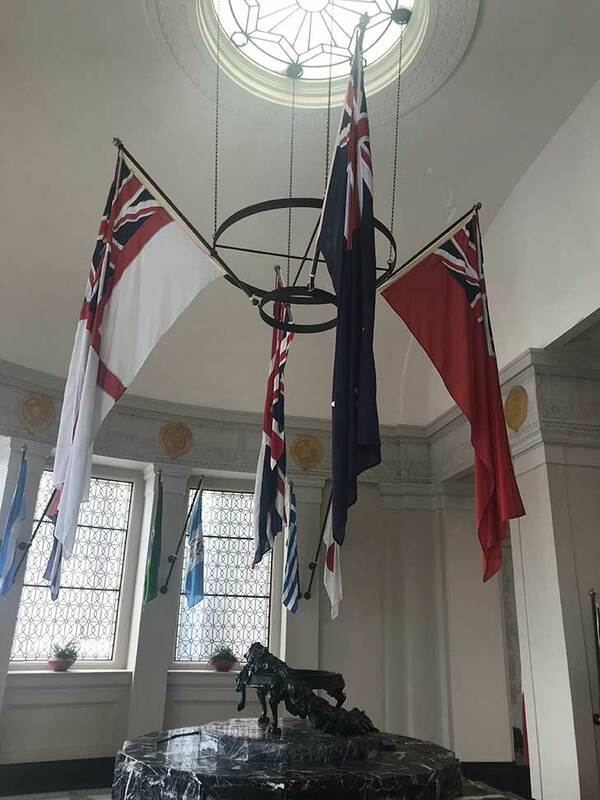 'The Mystery of the Flags - Auckland Museum's World War One Sanctuary Display', Auckland War Memorial Museum - Tāmaki Paenga Hira, Published: 29 02 2018.